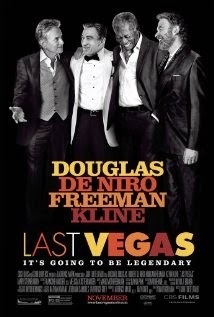 Not to be confused with Las Vegas, Last Vegas is a new film about (to quote IMDb) "Three sixty-something friends take a break from their day-to-day lives to throw a bachelor party in Las Vegas for their last remaining single pal." With a bunch of names you'll recognize - including Michael Douglas delivering his obligatory, I'm marrying someone much younger than me, performance for the year. I'm not sure I'd give great odds that this is going to be the best movie of the decade month, but on the other hand it may be less of a Debbie downer than Stand Up Guys. The main thing in short is that it's free and it's this coming Monday in downtown Seattle. You can find out all the details about the film via IMDb, or you can click over here to nab some free preview tickets (using code RWTFHBPM) and give it a try. Of course be sure to show up earlier than you normally would. Even at this point in his career it's possible De Niro may still draw a crowd. And preview screenings are generally overbooked to ensure a full house. Hmm I had heard about this movie after watching the trailer im about to rent it!